“What if I could bring your son back to you just one more time? “The other side of the door” is not really a bad movie. Technically speaking it really looks magnificent at certain moments. Moreover, India as location and the used ancient ritual sure made for a unique starting point. But ultimately it was only a collection of all sorts of previously used ideas. I thought it felt a bit outdated. That wouldn’t be such a huge problem if there was a certain tension or creepiness. Unfortunately, this was also missing, making it once again a horror that never exceeded mediocrity. The story reminded me of “Pet Semetary” with the loss of a child and the desire to bring it back to life again. 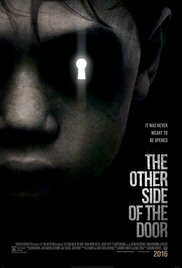 In “The Other Side of the door” Michael (Jeremy Sisto) and Maria (Sarah Wayne Callies) decided in an impulsive moment to stay in Bombay and to found a family. Years later we see how they have settled there, living in an idyllic looking house somewhere in downtown Bombay and their lives being enriched by the presence of their daughter Lucy (Sofia Rosinsky) and the typical family dog ​​Winston. However, it’s not entirely rosy because of the tragedy that occurred in the past, with the death of their son Oliver (Logan Creran) as a result. Maria is tormented daily by guilt and grief. Fortunately, Piki (Suchitra Pillai) the housekeeper has a grandiose idea. The things needed to fulfill this idea are the ashes of the deceased child, an old dilapidated temple and a nightly sleepover there. This could bring relief to Maria’s heavy psychological problem. But obviously there’s a golden rule that shouldn’t be violated. And of course it’s clear that is definetly going to happen anyway. Now we’re off to a kind of “The Conjuring” made in India. All kinds of objects suddenly start to move around and ghostly apparitions appear and reappear in the background. And for the umpteenth time we get a self-playing piano. And for God’s sake, when is anybody going to pay attention to the warnings of the dog. First the phenomenon is the kindness itself. Afterwards it turns out to be fairly aggressive again. Nothing new either. And just like in “Lights Out“, the solution to the problem is the relationship between the caring mother and the ghostly presence. Again so predictable. Throw in some primitive painted Indian folkloric figures, called the Aghori who practice rather peculiar rituals so they can communicate with spirits in the afterlife, and it’s complete. Those Aghori are creepy individuals appearing out of nowhere and producing an annoying, mesmerizing sound. But they aren’t as scary as Myrtu who suddenly begins to interfere with the whole affair. It’s a creature from the underworld that looks terrifying enough. I think they’ve used the “stop-motion” technique for this one (also an obsolete special effect). For me this was probably the most positive part of the film. All in all, it’s just an old-fashioned ghost story that didn’t take place in an American old mansion to my relief, but in dark India instead where the mystic about afterlife and primitive rituals are still alive among the elderly population. Clearly modern Western people shouldn’t experiment with such rituals. It’s nothing earth shattering, but it’s not bad either. Though expect a few strategically placed jump scares and a thoughtful ending.